Driving away from the baking lakeside environment of Lake Wanaka, I weaved down country roads (both paved & gravel) for about ten minutes, before reaching the home & vineyard of Akitu wines. It's founder, Andrew Donaldson was waiting for me in the shade of an umbrella, with a cold drink, taking in his rather enviable view from the slopes of Mount Barker, out across to Lake Wanaka & to the mountains beyond. Shaughn Jenkins sits down with Andrew Donaldson, to find out what motivated him to start Akitu & what makes his 100% Pinot Noir vineyard unique. Akitu's spectacular vineyard in Wanaka. Shaughn Jenkins: What motivated you to start Akitu here in Wanaka? Andrew Donaldson: I'm a Wanaka local. I was born here, I grew up here, and although I have spent significant portions of my life overseas, I always knew this is where I would settle. When I thought about returning in the early 2000's, I knew that if I was to own land here, I could really only do one of three things; farm sheep/goats, set up some sort of hospitality business/service, or plant grapes for wine production. I didn't feel like running around after animals, I have spent more than enough time in the hospitality industry overseas, and so the only choice left was to grow grapes for wine. It became my mission with planting proceeding in 2002 and 2003. Selling the grapes off to other producers for the first several vintages allowed me to recoup some of the costs involved in starting the vineyard, therefore it wasn't until some of the grapes from my site starting winning awards under other labels, that several friends insisted I make my own label to capitalise on what feels like unlimited demand for Central Otago wines. The first vintage was released from 2012, and to spread the word, I gave 2 bottles to each of my friends around the world and told them "Drink one, and give the other to someone else who loves wine". Sure enough, ever since that vintage, we have sold out every year! Shaughn: Aside from your family ties to the area, what makes this site you have your vineyard on so interesting? Andrew: Really it's completely unique in Central Otago. It's North-facing as most are, yet thanks to the sloping hillside here on Mount Barker, I have the different blocks of vines for this 11.8ha (29.15acre) site, laid out in a fan-like formation. It gives me access to different areas of the slope (steeper or slightly flatter), both higher & lower elevations, and a myriad of soil types. 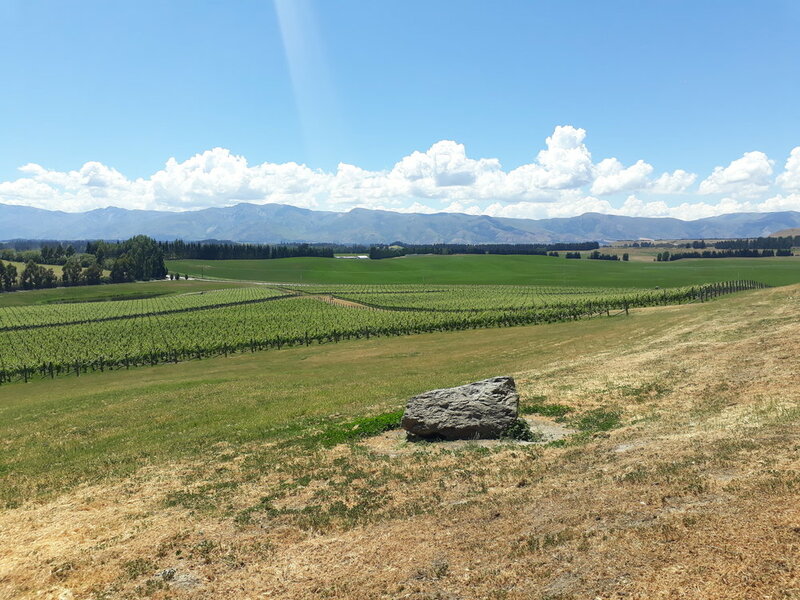 The steeper Western-side has a cooler night, but is exposed to the late afternoon/evening heat, while the Eastern-side doesn't get the afternoon heat, but it does get the intense UV light that the mornings here in Central Otago are so famous for. Diversity in light, heat, slope, elevation, soil type, really allows for this site to be my own special monopole, that produces it's very own style of Pinot Noir. Andrew & I survey the significant Spring growth. Shaughn: How about Wanaka as a sub-region? It's the smallest of Central Otago's sub-regions in terms of plantings, what makes it so interesting? Andrew: Acidity. 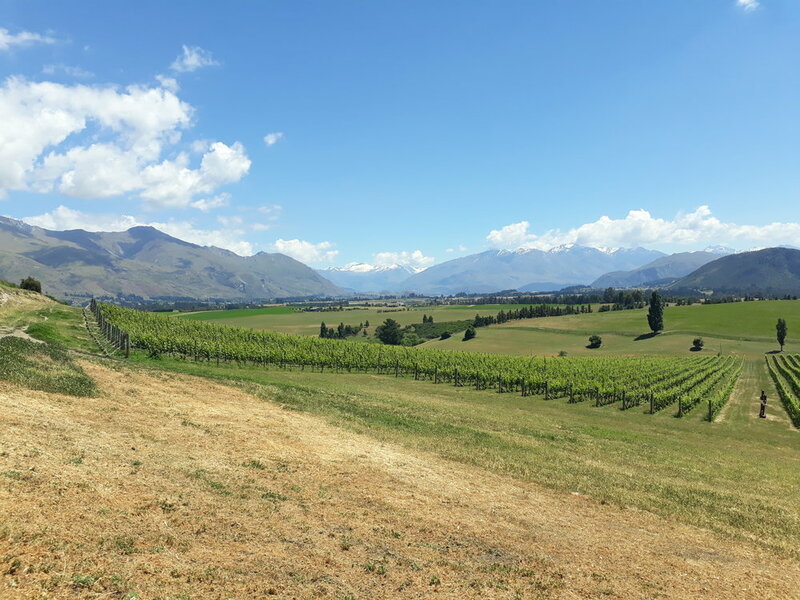 I find that while the producers around Wanaka have completely pieces of land, so the wines don't have too many similarities, the one feature that connects them, is high retention of acidity in Pinot Noir. The nights here are very cold (which helps retain acidity in the grapes as they slowly ripen), especially as most of the vineyards are higher in elevation here than the Cromwell Basin (where 70% of Central Otago's vineyards are located), with Wanaka vineyard being between 280-380m (918-1246ft) above sea level, featuring some of the highest vineyard elevations in New Zealand. Shaughn: Finally, where can people around the world get access to your delicious Pinot Noir? Andrew: Due to my personal and professional ties with the UK, much of my small annual production is sold there, though there is a small presence in the US, Australia, Denmark & France. Within New Zealand, I am distributed currently with Great Little Vineyards, and sell the remainder here locally in Central Otago. Andrew kindly took me through his two very different Pinot Noirs, the Akitu "A2 " Pinot Noir 2016 & it's bigger, reserve-like brother the Akitu "A1" Pinot Noir 2016. I found both wines to be incredibly expressive of Andrew's terrior-driven site, with the A2 Pinot Noir 2016 being one of the most easy-drinking, enjoyable Pinot Noir I have tasted in recent memory. Cracked pepper & cranberry aromas, with supple tannins, giving a smooth & refined body, all held up by that high natural acidity, making the wine almost refreshing. The A1 Pinot Noir 2016 was very different, with a darker purple hue, similar cranberry & cracked pepper notes that feel more aromatically powerful and hang around in the air, as if somewhat ethereal. The tannins are more pronounced, the body is richer and deeper, with an acidity that is so driven at this young age, that it felt like an electric current in the mouth. Spectacular wines, yet just infants at the moment, aged examples would be a treat indeed if you can hold onto them. Click here to visit Akitu!